Old Abe was an eagle. He was the mascot of the Wisconsin Volunteer Infantry 8th Regiment. 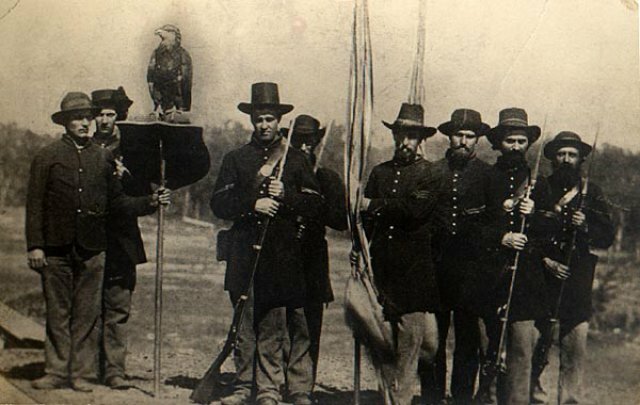 Old Abe went into battle with the men, perched on a pole. When not in battle, Old Abe wandered around camp, free to steal food. After the war, Old Abe became Wisconsin's special symbol. Today, there are still statues of Old Abe, photographs, and many stories of this special mascot. Jake was a rooster. He was the mascot of the 3rd Tennessee Regiment. Jake went with the men to prison when his regiment had to surrender. When Jake and his men were released after the war, people from Tennessee gathered to cheer his safe return. Jack was a dog, a bull terrier. He was the mascot of the 102d Pennsylvania Infantry. Jack was taken prisoner twice. The second time, it is said that he gained his release through a trade for a Rebel soldier.